In the center of the view is the Late Gothic Grote Kerk (Great Church) of The Hague, also known as the Jacobskerk (Church of Saint James). Its familiar profile, with the choir rising well above the nave, could be recognized from considerable distance. The same may be said for the two churches of Delft, which appear in the right background just to the right of four windmills. The taller rower on the horizon is that of the Nieuwe Kerk, close to which is the small tower of the Town Hall. The Oude Kerk is visible slightly farther to the west. The tower near the right edge of the panel is that of the Reformed Church in the village of Wateringen. To the far left (above the dog following a man in the foreground), the Kloosterkerk (Cloister Church), with a small spire, appears closer than, and to the left of, the large Ridderzaal (Knights’ Hall), which is in the courtyard, or Binnenhof (Inner Court), of the court complex. Immediately to the right of the Ridderzaal’s twin-towered façade, one sees the slightly closer Hofkapel (Court Chapel), with a small central spire. The tall, blocky form a little farther to the right is the Mauritstoren (Tower of Prince Maurits), which stands at the corner of the Stadholder’s Quarters (remodeled in the early 1620s). The next large structure to the right, seen midway between the Mauritstoren and the Grote Kerk, is the Oude Hof (Old Court, later called Paleis Noordeinde). 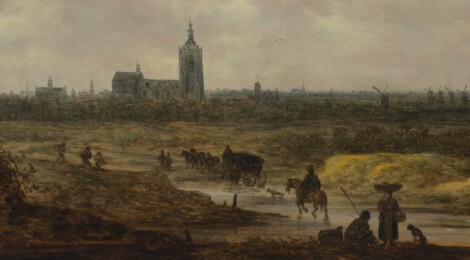 The faintly indicated building to the left rear of the Oude Hof may be Van Goyen’s anticipation of the Nieuwe Kerk, which was planned in 1646 but not erected until 1649-56. Below this building one can make out the sails of the Beekmolen (Brook Mill), erected in 1621. Just to the right of the Oude Hof, one sees the modest tower of the Engelse Kerk (English Church) on the Noordeinde, and then the Oude Stadhuis (Old Town Hall), with its tall tower of the 1560s. The short, square tower to the right of the Grote Kerk’s tower (and above the coach in the middle ground) is the Huis van Assendelft, a fine town house on the Westeinde. The distant church seen to the latter’s right is the Oude Kerk in Rijswijk, a village halfway between The Hague and Delft. Van Goyen moved from Leiden to The Hague in 1632. His first known view of the court city dates from 1637, but views of other cities, with compositions quite like that of the present picture, date back to at least 1633, when he painted the earliest of his several known views of Arnhem. Van Goyen’s views of Rhenen date from as early as 1636, and from the next year until at least 1653 he occasionally painted views of The Hague (at least nine are known), including a very large canvas executed in 1650-51 for the Burgomasters’ Chamber of the Town Hall (Haags Historisch Museum, The Hague). He also painted comparable views of Dordrecht (especially in the I640s), Brussels and Antwerp (1648), Delft (1654), and less well known places. Altogether about one hundred fifty views of cities, usually seen from a fair distance, as here, are known in Van Goyen’s oeuvre, which amounts to an eighth of his approximately twelve hundred surviving paintings. However, cityscapes that are similar to the present work in their attention to actual buildings number between about sevenry-five and a hundred. 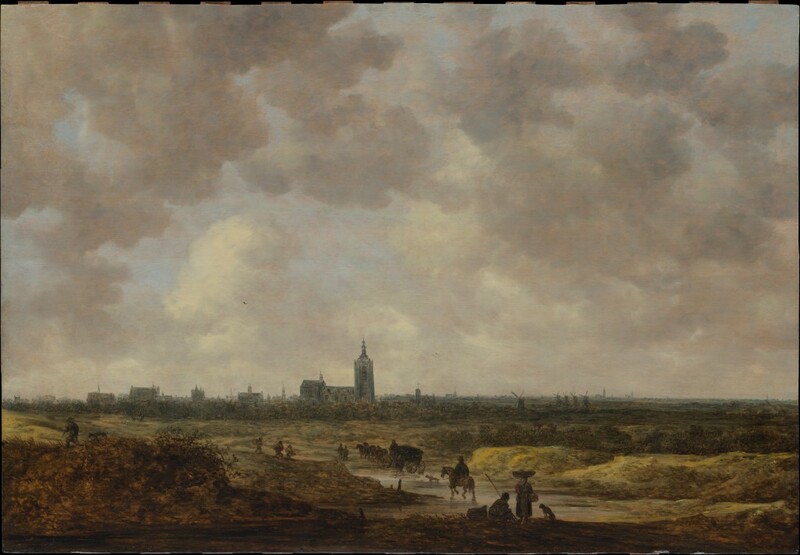 As the panoramic View of Haarlem and the Haarlemmer Meer demonstrates, Von Goyen’s interest in actual topography was not limited to views like the present one. A view of The Hague from approximately the same vantage point occurs in the background of a drawing by Van Goyen dated 1651 (Louvre, Paris). The sheet appears to be a study for another painting, rather than a sketch from life. It may depend on the present picture or related material.